The 605, 606 and the 710, 712 Large Passenger cars. 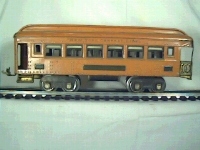 The 605 passenger car and the matching 606 observation were introduced in 1925 and cataloged through 1932. These were always three car sets with two Pullmans and an Observation. 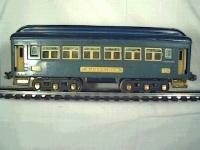 The 710 Pullman and the 712 observation were introduced in 1924 and made through 1934. These cars are even bigger than the 605 cars. It is easy to mistake these huge cars for small standard gauge cars. In fact the earliest cars use standard gauge 500 or 100 series wheels. These cars have swinging doors and added steps and air tanks. They are always lighted. 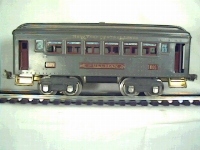 These were the top of the line cars O gauge cars until the 613 cars were introduced in 1931. Actually, the 710 and 605 cars got better billing in the catalogs and came with better engines than the 613 cars until they were dropped. So I guess they were always the top of the line cars. When these cars came with electric outline engines the engine is usually the same color as the cars. As always, cars are shown in order of production, with the earlier colored cars first. All cars have gold lettering unless noted. Dark gray, maroon inserts. These cars can be found lettered either New York Central Lines or Lionel Lines over the windows with Lionel Lines being harder to find. Came in sets with the 251 and 251E electric engines. 1925-1927. Also came in sets with a gray 4U probably in 1928 or 1929. Red, cream inserts. 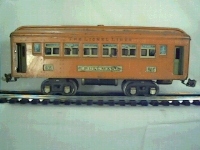 These cars and all the 605, 606 cars made after 1926 have Lionel Lines above the windows. Came in sets with the 251 and 251E electric outline engines. 1928-1930. Orange, cream inserts, pea green doors. Part of a special set made for Macys that came with either a 254 or a 4. Uncataloged circa 1931-1932. Macys sets did not have special lettering but had a brass drumhead on the observation railing that said Macy Special. 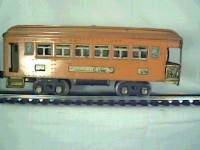 A special set with these cars and a 4U was made for GE in 1931. The GE set had no special lettering at all. Cataloged sets came with cream doors, and the 4U in 1929 through 1931. And in 1932 with the 254. The Pullman is missing a few steps. These cars can be found with square or rectangular windows on the doors. Compare the 605 car's door with the red car above. Note shown: Olive green, red inserts. Uncataloged 1931. Came in sets with the 254 locomotive. Rarity: The Olive green cars are the hardest to find. They may be the rarest classic period passenger cars. Red is easier to find than orange. The gray is the easiest color to find. The orange special cars are hard to find but nowhere near as hard to find as the olive cars. Orange, olive inserts, wood grained lithographed doors. 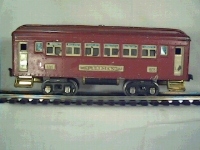 Came in sets with the massive double motored 256 electric engine. 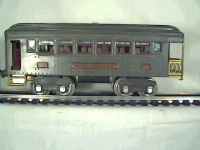 Top of the line O gauge set from 1924 through 1929. 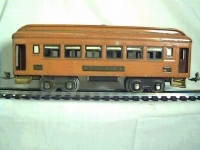 Orange cars come with Illinois Central, New York Central Lines or Lionel Lines over the windows. They also come with pea green or olive inserts. Cars with six wheel trucks may be made by replacing the four wheel trucks with the later six wheel trucks. It is doubtful that these cars were made with six wheel truck because the six wheel truck was introduced in 1933 and orange cars were not made after 1929. Red, ivory inserts, pea green doors. 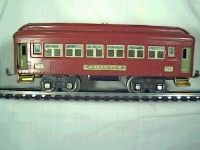 Came in cataloged sets with the 260E steamer and in uncataloged sets with a red 251E. 1930-1932 These cars can be found with four or six wheel trucks. Blue, dark blue roof, cream. Came in cataloged sets with the 260E in 1933 and 1934. Always has six wheel trucks. Rarity: The Blue cars are the most desirable but the red cars may be harder to find. All of the 710, 712 cars are highly sought after by collectors. Reproductions have been made of these cars. I am trying to keep the size of the images down so they load faster and take up less space, but I did want to include some larger images because the detail is better. To see bigger pictures of these a few of these cars click here. Thanks for spending your time looking at my site. If you would like to send me an article about almost any kind of toy trains for this site drop me an email with a short description. I really need articles about postwar trains.